Here we go again. Less than five months after the Camp, the 20th Chaos Communication Congress is about to take place between Christmas and New Year's Eve. Because our old venue has closed down last September, we are moving to the freshly reconstructed Berliner Congress Center. The building, that some of you might know from XXCCC, is located directly at Alexanderplatz being the neighbour of the Haus des Lehrers. There is additional information for members of the press. The Chaos Communication Congress is a three-day conference on technology, society and utopia. 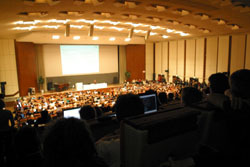 The Congress offers lectures and workshops on a multitude of topics including (but not limited to) information technology, IT-security, internet, cryptography and generally a critical-creative attitude towards technology and the discussion about the effects of technological advances on society. The Chaos Communication Congress is the annual congress of the Chaos Computer Club e.V. (CCC). The Congress celebrates its 20th anniversary and has established itself as the "european hacker party" bringing in people from all over Europe and even further away. Bring on your projects, show us your work. Learn and share alike and if you have something interesting to tell, apply for a lecture or workshop. The Congress is a volunteer-driven event. In order to keep the event cheap for everybody, we do appreciate any kind of support. If you want to help, please apply as a Chaos Angel. See you at the 20C3! If you experience network security problems that are clearly originating at the 20. Chaos Communication Congress network, please contact us at the number below. We will immediately try to resolve the problem by technical measures on our site. This number is ONLY for the purpose of reporting network security problems, all other requests will NOT be answered at this number. 20C3 Network Abuse Contact: +49 (30) 72622-42. For general contact information (Press, general Information etc.) please see CCC Press Info.